NASA has detected the smallest planet outside our solar system have been by NASA’s space telescopes. The planet is called Kepler-10b, is about 1.4 times Earth’s size and has an orbit so close to its star as lacking life, according to NASA. Planet Kepler-10b is orbiting it star about 20 times closer to its star than Mercury is to our own Sun. It takes less than one Earth day to orbit its star! The daytime temperature’s expected to be more than 2,500 degrees Fahrenheit, hotter than lava flows here on Earth. 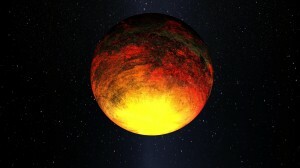 It is the smallest exoplanet (a planet located outside our solar system) discovered to date. All of Kepler’s best capabilities have converged to yield the first solid evidence of a solid planet orbiting a star other than our Sun. Knowledge of the planet is only as good as the knowledge of the star it orbits. Scientists of the Kepler Asteroseismic Science Consortium (KASC) were able to detect high frequency variations in the star’s brightness generated by stellar oscillations, or “starquakes.” Data arising from light waves that travel within the interior of the star lead to better understanding of the star, just as earthquakes are used to learn about the interior structure of Earth. As a result of this analysis, Kepler-10 is one of the most well characterized planet-hosting stars in the universe next to the Sun. This analysis also allowed scientists to pin down the properties of Kepler-10b. It is unequivocally a rocky planet, with a surface you could stand on, a mass 4.6 times that of Earth, a diameter 1.4 times that of Earth, and an average density of 8.8 grams per cubic centimeter — similar to that of an iron dumbbell. MOUNTAIN VIEW, Calif. — NASA's planet-hunting Kepler spacecraft has confirmed the discovery of its first alien world in its host star's habitable zone — that just-right range of distances that could allow liquid water to exist — and found more . Space station flight engineer Andre Kuipers will be in a unique position to observe Earth Hour, a public awareness project that asks people to turn off their lights for one hour at an appointed day and time. Weapons! Among other things which fascinated Indians a lot are the weapons used by the devas(gods) it carried on till ages because the technology was handed over from one generation to other . This might have happened till they ran out of . Who made the nazca lines?